I ran into an issue with getting the correct word-wrap behavior in Unity using the Canvas Text UI element. I wanted to create a simple dialogue system that added characters of a string a bit at a time in order to simulate character speech, a common-enough request. However, with Horizontal Overflow set to Wrap, line-breaks are added when the word flows outside the box. And since Unity doesn’t know how long the rest of the word is, the word jumps to the next line in the middle of writing, which looks weird. I adapted the following solution based off an answer found here. I set a total duration for the entire dialogue text to complete, and I find the index of the separator between visible text and invisible text. Then, with Rich Text enabled, I add the “color” tag, which sets the color of the rest of the text to 0 opacity. // Find midpoint in string. // Divide string in 2 and add color at separator. Now the Text element knows the length of each word in the string; it just doesn’t display the latter half. Admittedly, this isn’t the most friendly solution in terms of garbage collection, but it’s simple enough to implement on a first pass. I’d love to hear a smarter implementation, perhaps using StringBuilder? It’s been a while since my last post, but I randomly discovered that someone RT’d my tip about safe renaming in Unity. I just ran across something else that isn’t really complex, but I’ve had run-ins with it a number of times. I’ll continue to post common issues that I encounter if it ends up being useful to someone out there. Unity’s native GUI system is powerful and covers most use cases. But one thing I’ve consistently needed to do is create a number of child elements that are parented to a RectTransform that has a width that scales with screen width. 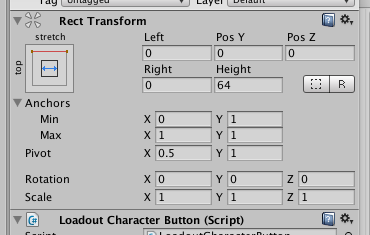 While your RectTransform may look fine when hand-parented in the hierarchy, Unity performs a number of hidden transformations when an object is instantiated from a script and then parented. What you see in the editor. What you see during runtime. 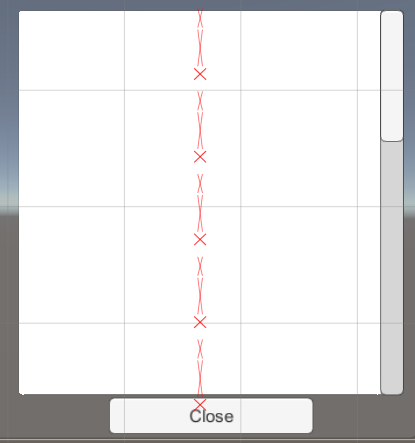 I needed to parent a number of characters to a ScrollRect menu, but their offsets were incorrect when parented. This probably occurs because my content panel width scales with the screen width, causing a bit of chaos when parenting and scaling the offsets according to my content width. Basically, I need to re-assign the x-values of my offset (the y-values are a fixed size of 64 and do not scale with screen height). // Create new button for char in inventory. // Reset position and offsets of button. 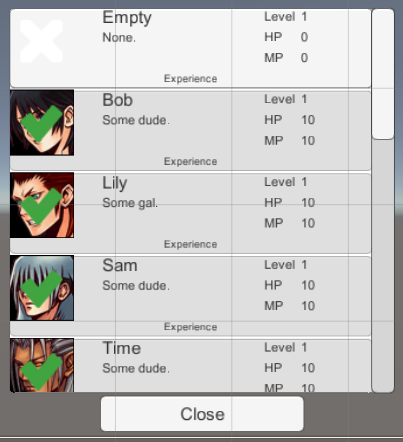 // Populate character button with info from inventory. The key is to reset the x-offsets to 0, or whatever you want the offsets to be. I’m keep the same y-offset, but you may have a different usage depending on what elements you want or don’t want to keep fixed. Also, the prefab that I’m instantiating is set to scale with the parent content. I have a scaling width, fixed height, and anchor and pivot set to top. After that, you should have no problems with the child element being rescaled. This is just a quick note-to-self, though hopefully it might help someone out with some headaches in the future. I’ve had a number of issues with renaming scripts/classes between MonoDevelop/Xamarin and the Unity engine itself. Refactor -> Rename of the class itself in the IDE will very likely cause a number of scripts to become unlinked within the script component attached to a GameObject. This will happen whether the GameObject is in the scene hierarchy or in the project, forcing you to re-link the script to the GameObject. 1. Rename the script file in the engine to the desired name. 2. Refactor -> Rename the class name in MonoDevelop/Xamarin. The Endless Runner genre has brought a lot to mobile gaming in its prime. The popularity of runner games has provided a fantastic entry point for scores of players to experience the gaming world. They are easy to learn and intuitive to play. That being said, I still considered them thoroughly boring to both play and develop. Alongside many other others out there in mobile development, I generally think that they’re a dead genre. Larger mobile studios love these games due to the low-risk existing market, minimal investment into design, and ease of monetization through extra skins and in-game currency. Basically, running-game innovation is over, and the market is over-saturated. Games are unlike movies, TV, and other entertainment media, as we are still creating new experiences and new ways to interact. There will always be new approaches to things in games. With that in mind, I sought to add my own take on an endless runner game by integrating the gameplay elements that I usually love to have in games but aren’t typical to the existing genre. Creating a separate timer and incrementing it with each Update() step can be useful…sometimes. Certain events that occur in Update() may need to reference the timer’s value directly, in which case it’s just easier to create a timer specifically for that purpose. But before you decide to create another float timer, consider that coroutines in Unity can make timed events easier to track and improve your code’s readability. It’s a clean, encapsulated way to run a sequence event outside of Update() while retaining functionality (and using a locally defined timer instead). Example: Move a GameObject for 5 seconds. Nobody gives a straight answer when asked “how do you make good comments?” The responses are all formatted in terms of what to do and what not to do. Don’t overdo it. Don’t try to make them look pretty. Be concise. The vague-ness of our answers exists because there’s no right way to comment, but there are plenty of wrong ones. Also, strong-arming a particular cookie-cutter series of required components can potentially lead to bloated, irrelevant comments. Even so, as an industry with so many existing development and production standards and so many different coding styles, why is there no standard practice for commenting? Would this not vastly improve the quality and readability of our collective code? When it comes to Unity, the entity-component system that the engine employs makes so much damn sense, it’s a wonder that not all development platforms follow a similar system. When so many games depend on interacting elements in 3D space nowadays, simplicity and flexibility are at the top of the list in terms of organizing assets and code. Okay fine, given that the functionality of this particular MonoBehavior isn’t very complex, we allow for simplicity in the comment. However, the way the Unity Engine is set up, the ability to create ambiguously floating scripts often lends itself to require answers for two questions: where do I go, and what do I do? Answer them, and for the most part, you’re golden. Recently, I looked back at some art pieces I did about 2-3 years ago or so. After going through the usual “oh god this looks awful” reactions that comes with improvement over time, I noticed something that was missing in my more recent work. There was a sense of adventurousness and creativity that I had not seen in a long time. 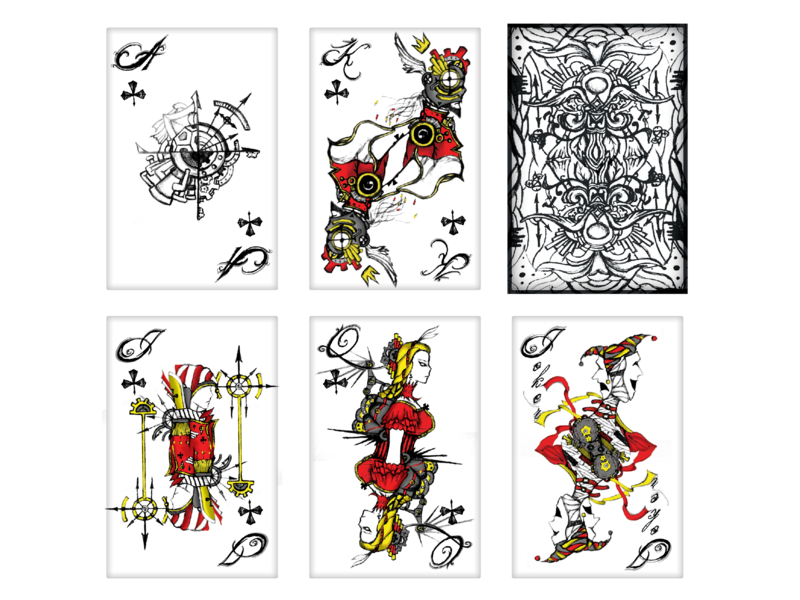 In 2010, I played around with a project making playing cards that used C2 symmetry. 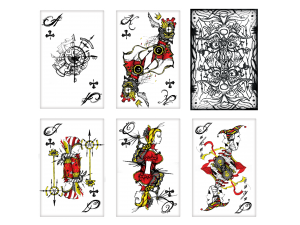 I wanted the end-product to combine hand-drawn and techno-punk aspects, and playing card styles seemed like an ideal platform to try out the idea. At first glance, I immediately identified issues with proportions, line-work, layout, and a host of other embarrassing problems, but the ideas were there. The imagination was there. The core part of creating interesting gameplay derives from established norms of fun and imbues them with differentiable aspects that make the game unique. In an art sense, this can mean adding mechanical elements to contrast medieval themes, creating steampunk-like properties. In designing gameplay, surprising the player by applying a twist to what’s expected is crucial to making a good game. For the most part I’ve transitioned away from art and almost exclusively code gameplay for games. Reflecting back, the goal now is to channel that naive, explorative mindset and add it to the work that I’m doing now. When art challenges our perception of reality, our senses have been usurped by someone else’s imagination. Successfully accomplishing this feat is what drives the creation of the art game. Ultimately, the role of an artist is to draw upon unique perspectives, inviting others to evaluate their world from a foreign point of view. Our collective growth requires the constant challenging of expectations and understanding of how things are or should be. Sadly, we can only exist in our own separate worlds, limited by the extent of our perceptions. Art is one way to deliver an alternate version of reality that plays by the rules of the artist. By sharing these experiences, the preconceived impossibilities of our separate worlds suddenly become connected and realizable. I'm a programmer and a gamer living in San Francisco, surrounded by coffee shops, craft beers, and macbooks. You might find me amongst my caffeine-injected brethren, staring blankly at Unity or Xcode. I'm always open to new game concepts, ideas, and opportunities to make games! Copyright © 2019 Visual and Game Programming.